She made a little piece of history when she became the first female beer inspector for Cask Marque, the lucky people who test and taste the quality of the nation’s ale. 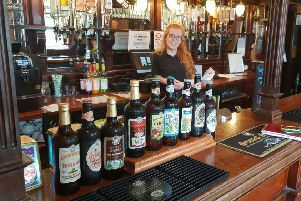 And now Annabel Smith, from Horbury, near Wakefield, is celebrating another milestone in a career that started with her pulling pints in her local in 1990. The qualified beer sommelier is one of 100 pioneering women whose portraits feature in a new exhibition by acclaimed photographer Anita Corbin at London’s Royal College of Art. Speaking today about its launch event, Annabel told the Yorkshire Evening Post: “A lot of the women who feature in the exhibition were there and it was great to meet them all and find out more about their stories. “I felt in very esteemed company, these are women who really have been trailblazers. Annabel isn’t the only Yorkshire pioneer featured in the exhibition – its other subjects include Dewsbury-born Baroness Betty Boothroyd, the first female Speaker of the House of Commons, and Leeds’s Nicola Adams, the first woman to win a boxing medal in the history of the Olympics. The exhibition is taking place to mark the 100th anniversary of the passing of the Representation of the People Act, which extended voting rights to more than eight million women in the UK. A decade in the making, its portraits are each a metre tall and have been framed and presented without glass or mounts with the intention of providing a “visceral connection” between artwork and viewer. Women featured include everyone from Suzi Quatro, Victoria Coren Mitchell and Angela Rippon to Nicola Sturgeon and Dany Cotton, the first female commissioner of the London Fire Brigade. The exhibition, entitled First Women UK, runs until August 22.